Long ago, car manufacturers learned that they could better serve their customers by offering a variety of options, from which customers could pick and choose. 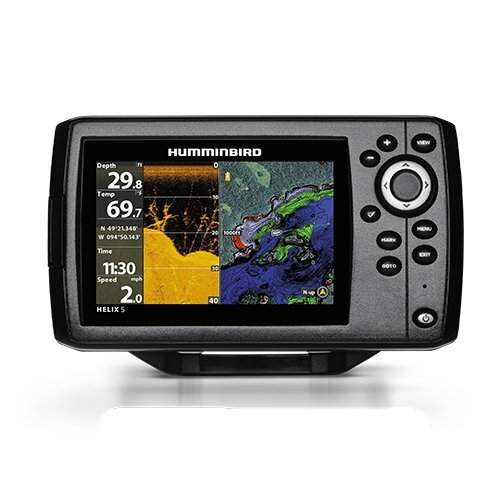 Humminbird takes the same approach to their fish finders, including the Humminbird HELIX 5, as each model is available with a variety of different options. Accordingly, Fishing Tech has selected one model in the Humminbird HELIX 5 Series – the HELIX 5 DI G2 – to review in detail. However, we’ll also break down some of the other option packages that comprise the line, so you can make the most informed choice possible. The entire HELIX 5 Series is pretty impressive and earns a B rating. 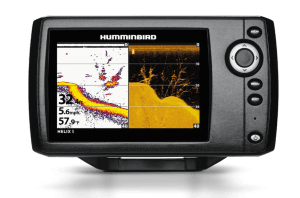 The Humminbird HELIX 5 DI G2, however, is one of the most affordable models in the HELIX Series, so it doesn’t include a lot of the more advanced features the more expensive versions do. Accordingly, we rate this specific model as a C+. It is a great option for beginning anglers, who are looking for a first or second fish finder, but most would probably be better served by selecting one of the more feature-packed models in the HELIX series. The HELIX Series DualBeam PLUS Sonar allows you to use either of two sonar beams. One of the beams produced a very narrow cone of sound waves, which allows you to observe the world beneath your boat in great detail and works very well for imaging the lake bottom or deep-water structure. By contrast, the wide beam is better for scanning large areas in a short amount of time. The HELIX 5 DI G2 includes a down-imaging scanning sonar, which helps provide exquisite detail of the cover, structure and other hard surfaces beneath your boat. Down-imaging sonar works by emitting a series of sound waves, which are recorded as thin sonar “slices.” The returning waves are then interpreted by the unit’s internal computer and displayed on the HELIX’s screen. The HELIX 5 DI G2 includes Humminbird’s trademarked SwitchFire sonar technology, which allows you to customize the way the sonar data looks on the screen. With the push of a button, you can add or remove details from the display image to help you better view the information important at the moment. There are two basic modes accessible with SwitchFire: Clear mode, which filters out most of the noise and clutter displayed in choppy or sediment-filled waters, and Max mode, which provides an incredible amount of detail, which even allows you to see individual fish, your lure and the action you are imparting on it. Several fish finder manufacturers allow their clientele to pick from between a few different versions of the same basic product, but Humminbird truly embraces an option-heavy ethos and provides anglers with a number of different ways to customize their unit. You can’t pick and choose from an infinite variety of options, but you’ll certainly find that the HELIX Series contains a model that will suit your needs, without requiring you to pay for options you don’t want. There are seven different option packages in the Humminbird HELIX 5 Series. The HELIX 5 DI G2 is one of the most affordable options in the collection, which means that it lacks many of the features available in the more expensive packages. The HELIX 5 DI G2 may not have some of the features that more expensive fish finders do, but it offers most of the things that anglers who are looking for a first fish finder need. Additionally, most anglers who try HELIX Series fish finders report that they are easy to use and highly effective. Most fish finders feature pre-loaded software that is not easy (or possible) to upgrade as your needs change and the manufacturer releases product updates, but HELIX Series fish finders don’t suffer from this problem. The software loaded onto the unit is easy to upgrade and update, which will allow you to stay on the cutting edge of fish-finding technology. HELIX Series fish finders collect a lot of data to help you better understand the watery world below. However, to put this information to good use, you’ll need to be able to visualize this data in a coherent manner. Fortunately, the HELIX 5 DI G2 provides a split screen zoom function, which allows you to view two different types of data at the same time. Unlike some other fish finders, which feature complicated and confusing user interfaces, the HELIX 5 DI G2 features the X-Press Menu System. An intuitive interface, the X-Press Menu System will allow you to navigate with ease and quickly access the different features of the unit. A good fish finder must be responsive so that you can adjust your techniques and presentations quickly; otherwise, you may see fish on the display screen that have long since left the area. Fortunately, the HELIX 5 DI G2 features Instant Image Update, which displays data on the screen in real time. The HELIX Series displays feature an LED backlight, which makes it easy to see the screen and interpret the images no matter the weather conditions. This is especially valuable for anglers who like to fish in very bright or very dim conditions. Like most other fish finders, the Humminbird HELIX 5 DI G2 has a number of strengths, as well as a number of weaknesses. Some of the most notable are below. LED backlight and great image quality, which makes it easy to see the display in any weather conditions. You can scan large areas quickly or view detailed images of the bottom with the DualBeam PLUS Sonar. The down-imaging scanning sonar provides nearly photo-quality images of structure and cover in the water. Intuitive and easy-to-use interface means you’ll spend more time fishing and less time navigating various screens. SwitchFire Display allows you to customize the display to provide the type of information you want. The best way to ensure you are getting the best fish finder for your needs, as well as the best value for your dollar, is by comparing any fish finder you like to other models. This includes models made by the same manufacturer, as well as comparable units made by other companies. 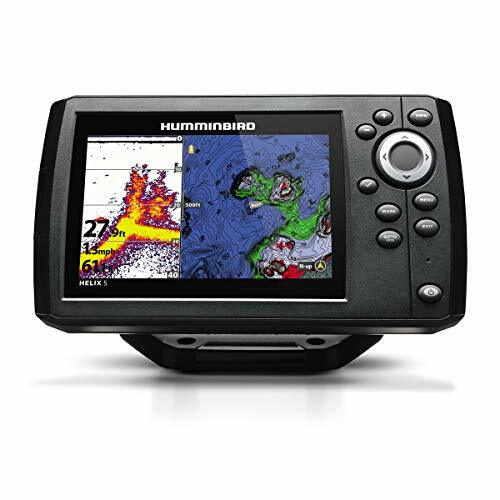 The Humminbird HELIX 5 DI G2 is one of the most affordable models in the HELIX Series. If you’d like a unit that also feature CHIRP technology, you’ll need to spend a little more money and upgrade to the HELIX 5 CHIRP GPS G2. However, you’ll also get a built-in GPS module with this unit, as well as chart-plotting capabilities and built-in navigation maps. Given that this model is only about $50 more than the HELIX 5 DI G2, many anglers will find that the CHIRP GPS G2 is the better value. On the other hand, if you would like to spend as little as possible while purchasing your first fish finder, you may want to consider the least expensive model in the HELIX series, HELIX 5 Sonar G2. You’ll save about $50 on this model, but you won’t get to use the down-imaging scanning sonar that the DI G2 features. The HELIX 5 DI G2 is roughly similar (in terms of both price and features) to two different fish finders: The Lowrance HOOK-4 fish finder and the Raymarine Dragonfly 4PRO. The Lowrance fish finder is about the same price as the HELIX 5 DI G2, but it comes with a number of features that the HELIX fails to provide. Most notably, the Hook-4 comes provides chart-plotting functionality, which will help you navigate around the water with ease. The Lowrance unit also features CHIRP technology, which provides very high-quality images. However, the Lowrance HOOK-4 features a 4-inch screen, which is a full inch smaller than the HELIX’s screen. The Dragonfly 4PRO offers chart-plotting functionality like the Lowrance HOOK-4 does, although it costs a bit more than the HELIX 5 DI G2 does. Additionally, the Dragonfly 4 Pro (like all Dragonfly series products) features a sealed display screen, which is guaranteed never to fog up. However, like the HOOK-4, the Dragonfly 4PRO has a smaller screen than the HELIX 5 DI G2. See our Raymarine Dragonfly 4PRO review. In a nutshell, the primary tradeoffs involve price, screen size, chart-plotting capabilities and CHIRP technology. The Humminbird HELIX 5 Series is a great product line for anglers who are just entering the world of fishing electronics. Available in a variety of configurations and option packages, the HELIX 5 Series gives you the chance to select a unit with the features that are important for your needs. This allows you to maximize the value you get for your fishing-gear dollar and avoid having to pay for capabilities you are unlikely to use. Fishing Tech rates the entire HELIX 5 Series as a B, and the HELIX 5 DI G2 – a relatively affordable, stripped-down fish finder that will serve as a great introduction to fish-finding technology – as a C+.